This post is contributed by Aleksandr Gelfand, a graduate student in the Archives and Public History Program at NYU. He currently works at the University Archives and is processing the Records of the Grey Art Gallery and Study Center. The Grey Art Gallery and Study Center opened its doors in 1975 and has since curated and displayed numerous exhibits on a wide assortment of topics. Few visitors to the gallery know about the sorts of voluminous records that each exhibit generates or what happens to these records after an exhibition ends. In 2011 the New York University Archives accessioned the records of the Grey Art Gallery, and they are now in the process of being processed and organized in order to be made available to researchers. The records chronicle the life of an exhibit from its initial inception as a proposal, to the intense research that goes into its curation, and to the final shipping details, where the items are returned to their lenders. 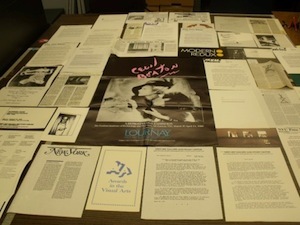 While many of the items in the files are unique (original artworks and letters from artists as an example), a large amount of ephemera created to promote and publicize the gallery is not. Printed and collected with the intention of providing information on a transient event, items such as press releases, brochures, posters, pamphlets and clippings are frequently discarded as soon as the event is over. Many times ephemera are only preserved due to a concerted effort on the part of an institution. Luckily, the Grey Art Gallery has managed to preserve a large amount of ephemera from most of their exhibitions. Using some duplicates found in the exhibition files, the University Archives mounted a small display to demonstrate some of the more mundane ephemeral items usually found within these files. Looking at the display, some of the problems with housing these items immediately become apparent. Clippings show signs of acidity, which will eventually make them brittle and cause them to crumble. Glue used to attach items to backing has long since dried, leaving these items to fall off and disappear. Finally, oversize and irregularly shaped items such as posters are frequently folded, sometimes incorrectly, resulting in deep creases that make unfolding and flat storage difficult. One of the goals of the NYU Archives is to preserve these items in as pristine condition as possible. Stored under low temperature and relative humidity, in proper acid-free containers, the archive insures that these items will have a longer life than if they were kept elsewhere. Some of the posters may in the future be sent to preservation in order to be flattened through a humidification process. The duplicates of the Grey Art Gallery ephemera may be found on the tenth floor of Bobst Library in the University Archives. For more information or to consult the Grey Art Gallery Exhibition Files, please contact the Archives.